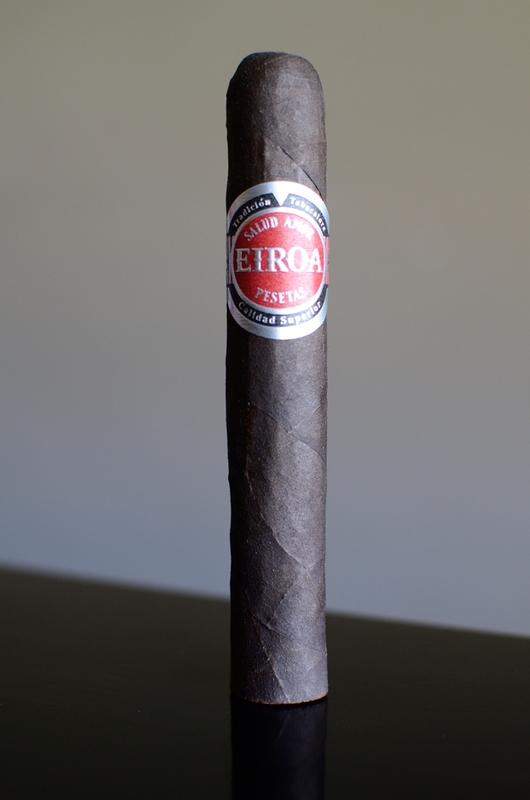 Eiroa’s CBT Maduro is next up on the chopping block. Hopefully you all partook, and enjoyed a fun and safe Oktoberfest! We had a bunch of friends over, drinking, and eating I up. Anywho, back to the review. While not the first cigar that Christian Eiroa has made using all Maduro leaf, the CBT Maduro is quite a departure from the normal. Created at Christian’s El Aladino factory in Honduras, the CBT Maduro features a Maduro wrapper, binder, and filler tobaccos. “CBT Maduro” stands for “Capa, Binda, Tripa” which stands for “ Maduro Wrapper, Binder, and Filler”. 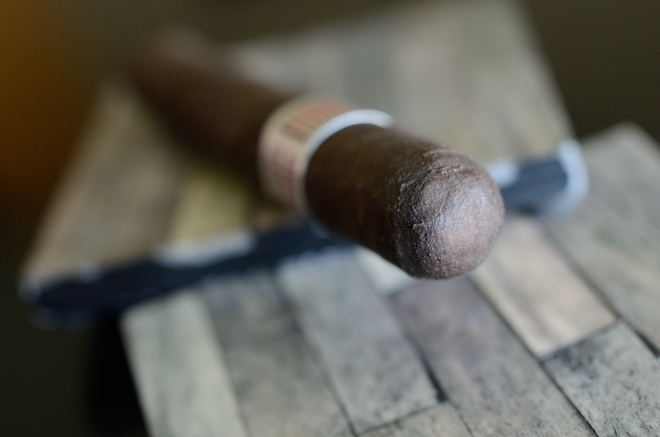 Christian didn’t disclose the origin of the tobaccos used, but he aimed at created a full-strength, full-bodied cigar using Maduro wrappers that are naturally darker in color due to the nutrients an sun exposure versus a darker color due to other processing. The CBT Maduro will come in 4 different sizes all offered in boxes of 20: 48 x 4 Prensado, 50 x 5, 54 x 6, and 60 x 6 ranging between $9.16 and $12.16 a cigar. At this time, there is only enough tobacco available to make about 150,000 cigars. We’ll start with the wrapper on the Eiroa CBT Maduro. This thing is DARK, I mean, it’s almost so dark brown, it’s black. It’s very consistent too it almost looks unreal. The texture is very rough, and very toothy. It feels like straight up sandpaper. 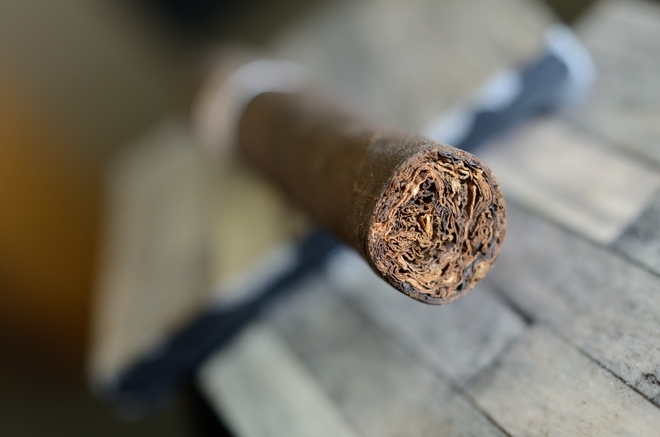 The wrapper is very hard and dense too as its laid seamlessly throughout the body of the cigar. This cigar could probably do a good amount of damage as a weapon in a street fight. Anyhow, the CBT Maduro is capped off with a beautifully round double cap that blends so perfectly into to body that it’s difficult to even find where the cap ends. 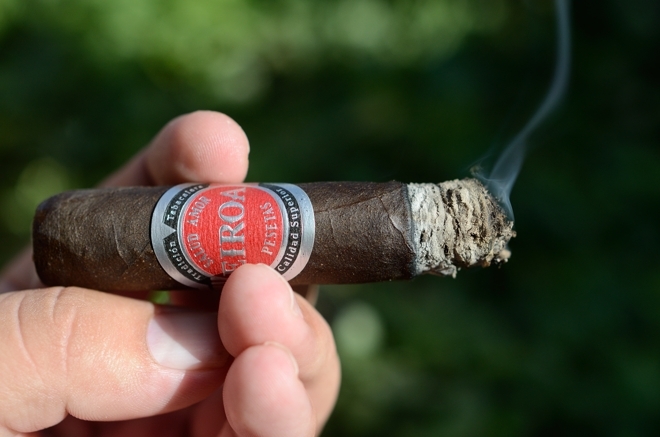 The CBT Maduro is polished off with a silver, black and red band carrying the Eiroa crest. 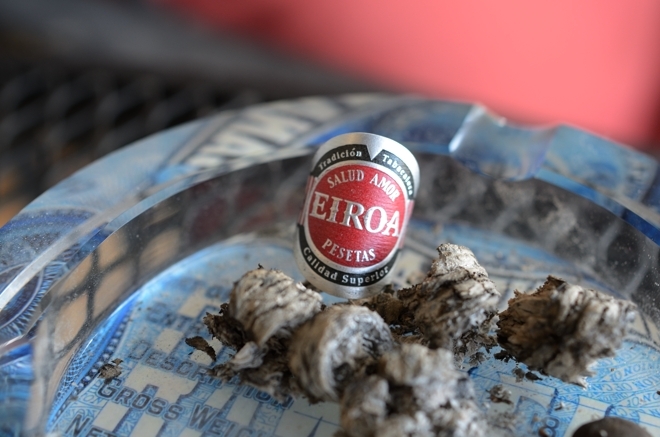 The wrapper on the Eiroa CBT Maduro’s wrapper gives off a very strong chocolate and coffee aroma while the foot of the cigar showcases some subtle sweetness mixed in with the spiced tobacco aromas. The cap cut like butter using my double bladed Palio cutter. The cold draw was very, very sweet with lots of chocolate and spice notes. The Eiroa CBT Maduro starts off with a huge bust of black pepper that I wasn’t expecting. After the first few puffs the pepper faded out and I was left with a ton of dark chocolate, espresso, spice, and raisin. The flavors are very creamy, and very deep while still experiencing a bit of strength even at the start of the experience. The draw is perfect. Each little puff results in a good cloud of thick smoke. The burnline is a bit wavy to start, but looks to be correcting itself as I close out the first third. The ash left behind is a bit flaky, and zebra striped light and dark gray which held on for an inch before falling to it’s doom into my ashtray. As I venture into the second third of Eiroa’s CBT Maduro, a really strong, deep, cedar has began to make it’s presence known in the flavor department. Wrapping around the cedar is the dark chocolate, espresso, spice, and raisin I picked up before. This is an incredible mixture of strong flavors which melt in seamlessly with one another resulting in a very creamy and balanced experience. The retrohale is really sharp with lots and lots of pepper backed by chocolate and cedar. It’s not very easy on the nasal passages. The burnline is now rocking pretty damn evenly without any touch ups and razor thin. I am feeling a bit of nicotine in this full strength smoke as I close out the second third, but nothing too daunting. 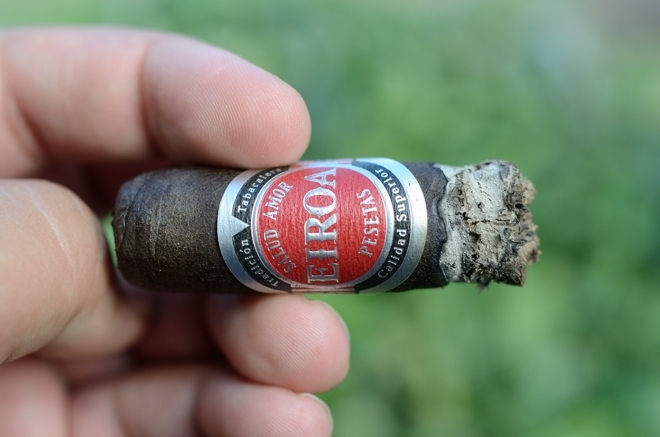 The strength has really ramped up into the final third of the Eiroa CBT Maduro. The flavors have began to take a step back and all mashed into one another creating a very smooth and creamy finish. The main flavors are still much of the same with the deep cedar, dark chocolate, espresso and raisin while there is a more spice and a lot of sweetness making it’s way in. The CBT Maduro smoked very slow, and in the 1.75 hours it took to take this cigar down I experience absolutely no harshness at all. In fact, the cigar had gotten considerably smoother as the smoke progressed. The CBT Maduro did leave me with a nice little nicotine kick. I have to say, this is probably one of the more potent cigars that I’ve had from the hands of Christian Eiroa, but not once did the power impact the pleasurable smoking experience. 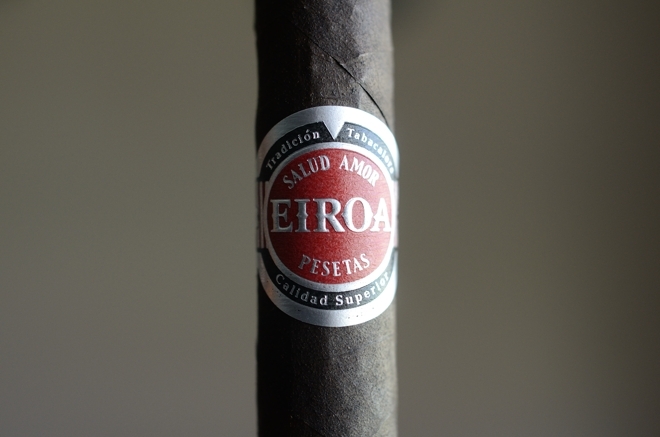 Eiroa’s CBT Maduro has been out for a few months now and I am honestly quite surprised that it hasn’t generated more buzz than it has. The rich flavors, full-body, and full strength entice even the more sophisticated cigar-smoking palates while the old school maduro presence will bring the more traditional, and novice smokers out of the woodworks. Sure, the CBT Maduro does come with a premium price point, but it’s one that I would gladly pay over and over again for the complex, balanced, and flavorful smoking experience. I’ve been a long-time fan of Christian’s work and now, more than ever, is the man showcasing quality production. I would urge you to pick up a few of these while you can. I’ve had a real good run of nothing but great reviews as of late, and the CBT Maduro just adds to the pile of consideration for the best cigars of 2014. This pairing was pure bliss. 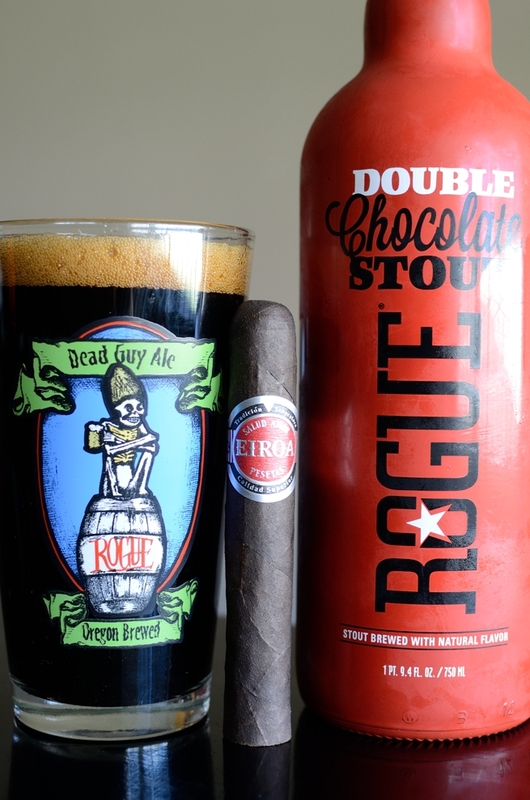 The natural choice of pairing such a deep chocolate enriched cigar with a deep chocolate enhanced beer was an easy one. Rogue’s Double Chocolate stout is brew at the Rogue Ales Brewery in Newport, Oregon. Coming in at 9% ABV this imperial stout leads with very strong chocolate and spice notes, with a heavy mouthfeel and a creamy, spicy, milky aftertaste. I especially liked the way the spice and the subtle coffee flavored matched up with all the spice and espresso from the CBT Maduro. This pairing was much like having tiramisu with a cup of creamed espresso. The CBT Maduro will pair perfectly with any coffee mixture, any stout, and most spicy red wines. If you haven’t already, make sure you check out Jeremy’s review of the Riot, a Stogieboys exclusive to find out how you can win a full box of the cigar for you very own. ← Previous Story StogieBoys Riot Cigar Review and Box Giveaway! That pairing sounds like a chocoholic’s delight. 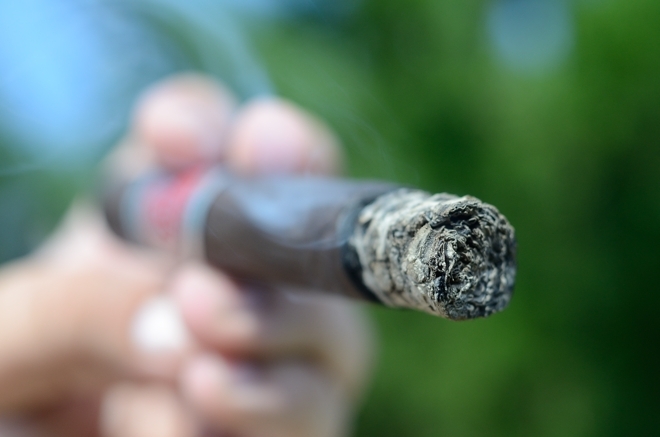 How does the CBT compare to the old Camacho Triple Maduro?